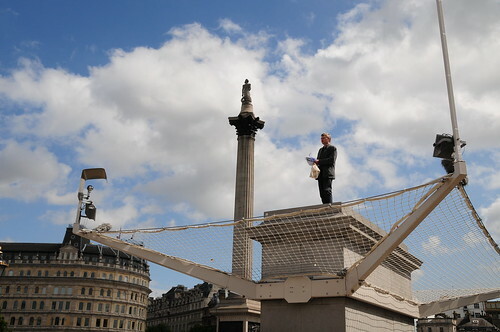 I'm always interested in the displays on the fourth plinth at Trafalgar Square. Because I'm in London once or twice a year, the art changes nearly every time I revisit. This time exhibit is somewhat different. It's changing constantly. When I was there earlier this afternoon, this man was reading various messages from the people at the square. The reaction in the local press has been very mixed. More serious papers are not impressed. I'm not an art critic - but I do like it. It's fresh, it's different and, perhaps more importantly, it's dynamic. The artist is Londoner Antony Gormley. More information is available here including a live feed of the various performances. The one that's on right now as I type this is awful! 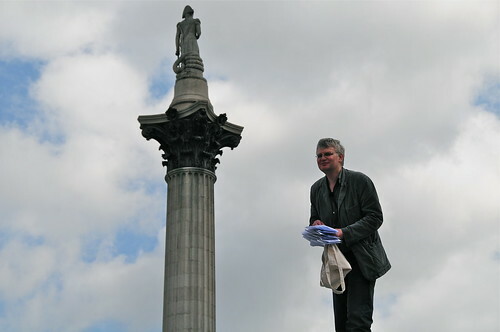 It's a man holding English, Welsh, and Scottish flags and he's talking about the buildings around Trafalgar Square. Until today, I didn't think it was possible, but he has managed to be worse than those dreadful 'historians' on tour buses. Lol! Sounds like you want to knock him off that perch! hahaha! I do like walking around trafalgar square and there is a bookstore on one of the corners.